Wait a sec, where did July go? July is the cream in the center of the summer cookie, and it seems I’ve licked it clean. It’s been a tasty month, not to worry. July started with a few days up in York Harbor, Maine, at Sylvie’s in-laws, where we spent the mornings tag-teaming crossword puzzles, eating cherries, and vying for the best reading seats on the wraparound porch. Mid-month, some friends went out of town, and we jumped at the chance to enjoy their CSA share for that week. 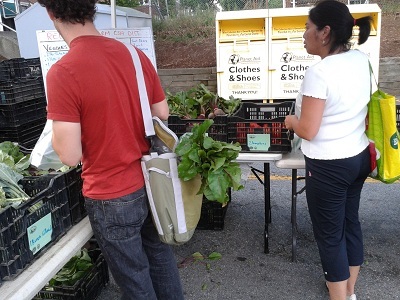 I’m used to my share coming in a box, but theirs, through Red Fire Farms, is set up is like a mini-farmer’s market: you pick your own veggies to match the allotment for the week. The produce was really exquisite, and, as a Western Mass native, I was delighted to learn their farms are located in Granby and Montague. I advised the two women running the stand to make sure to get to Montague this summer, even if to take an afternoon off for lunch and a visit to The Book Mill. So we started the month out of town and with an empty fridge and ended up with a bounty. Pounds of carrots filled my crispers, and beets and their thick green leaves poked out of my middle shelves whenever I opened the door. My cupboard barely shut with the piles of potatoes July was offering us. I panicked for just a second, not knowing what to do with all the vegetables. 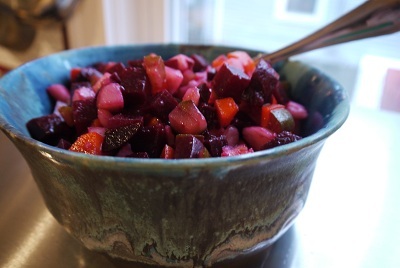 But then it dawned on me that I had all the ingredients for my very favorite beet salad, a salad, I realized with some embarrassment, that I had never shared on this blog. 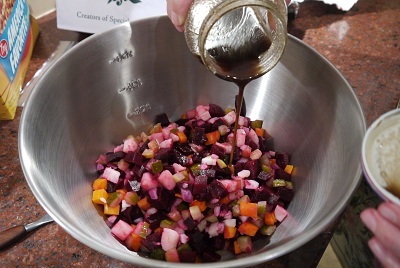 Beet vinaigrette, along with Salad Olivier, is a Russian salad I enjoyed at my best friend’s house growing up. (Sure, she’s originally from Latvia, but this seems to be a catch-all Baltic dish. At some point I’ll get Salad Olivier up on the blog. Love that salad. Love it, love it.) The recipe I use, and the one my mom uses, is from Spice and Spirit cookbook, that purple cookbook with the perfect hamentashen dough recipe. The authors note that this salad is often served “as a side dish at a Kiddush” which makes sense because it’s a cold dish that can be made ahead or assembled from ingredients cooked before Shabbos. Sure, boiling potatoes and cooking beets takes some time, but I prepped all the vegetables for this salad over a few days. Although the recipe calls for boiling the beets, potatoes and carrots all in one pot, a few days ago I grabbed the beets that were in the fridge, cut off the greens (and set them aside for some nice sautés with garlic, maybe some ginger) gave them a rinse, and placed them into a lasagna pan (something that had sides). I filled the pan with about a half inch of water, covered and sealed the entire pan with foil, and tossed it all in a 400 degree heated oven for an hour or so. I knew they were done when a fork easily slid in and out of them. When the beets were cooled down, I tossed them into a bowl, covered them, and put them in the fridge. For the past few days, I’ve grabbed a beet or two, run them under cold water which allowed their skin to easily slip away, and added them to salads and dishes. Couldn’t be easier. Last night I peeled some potatoes and carrots and set them in a large pot of water that I brought to a boil as I sat and watched the Olympics in the other room. Again, couldn’t be easier. So even though the beets, carrots and potatoes had to be cooked beforehand, the actual assembling of this salad took just a minute or two. I have a friend whose Mom is Hungarian, and I’ve noticed that she tends to keep boiled potatoes on-hand in the fridge at all times. It really does make putting together a meal a snap. The amount here is massive and can feed a dozen. Feel free to halve, or even quarter, this recipe. I also tend to always have red onion on-hand, so I usually sub that in for the scallions, making this a pretty dandy pantry recipe for the summer or winter. Scrub potatoes, carrots, and beets and place in a 4-quart pot. Cover vegetables with water and cook until soft. Potatoes and carrots will become tender before the beets. Remove them and continue to cook beets. Let vegetables cool, and peel; cut potatoes and beets into cubes. Peel and dice carrots, scallions and pickles and then mix all vegetables together in a large mixing bowl. Mix together dressing ingredients, add to vegetables and toss well. Potatoes will take on red appearance. Chill and serve. I’ve been meaning to get in the habit of having boiled or roasted potatoes in the fridge ready to go at all times. Here’s yet another reason. I like the idea of prepping the ingredients over several days – it makes the final product seem that much easier! This seems like a great use for all the root veggies I keep getting in my CSA.